I will probably be scolded by the public health and safety people for giving you this tip – so just in case, I will say this: No matter what, do not follow this advice. This is a terrible suggestion. Do not do this. This is crazy talk. I try to avoid using a microwave. In fact, I find that warming leftovers on the stove is faster anyway. True story. So what do I do when the meat is frozen and I need it for lunch in an hour? I simply put the frozen meat into a pot of hot water. It thaws within minutes. I cook it right away. We eat. I feel much better about this method than I do about using a microwave. Plus it works great. Now walk away. This conversation never happened. I always thaw my meat like this and by hubby is a Public Health Officer in the military. He’s in charge of food safety for a whole Air Force Base and he approves! The only difference is I use cold water, not hot. From everything I’ve read, cold actually works faster. I’m interested in how cold water would actually work faster? What is the explanation? To me, that would go against everything I know about science. Then again, I don’t know everything! I know you use cold water for food safety reasons. I’m just wondering how cold water is supposed to work faster than warm/hot water. Using cool running water keeps the food safe by not letting it get warm enough to be in the danger zone but also works faster because of the circulation of the water. I typically run a bowlful of HOT water and stick it in there. Same difference- really! But don’t tell anyone I said so! Yes – we do this all the time as well. From what I understand (from my limited experience in the restaurant industry), it is dangerous to be at a room temp for a longer period of time. We don’t use a microwave either and have no issues with thawing our meat in a sink of cold water (slower, but we keep it chilled) … or hotter water if we don’t have much time. You are so refreshing to us all keeping it REAL! Rebecca is my dear sister (who probably got me reading this wonderful blog), so of course I agree with her. I also do this with caution, as Laura suggested. The safest way is to use cold water, but if you “cheat” and use the hot or warm water, just be sure to thoroughly cook the meat right away. One more thing…..with ground meats, I just slowly cook it from rock solid right in the pan. You just need to keep turning it, scraping off and breaking up the cooked meat as you go. It doesn’t take much longer than from thawed. This is always done in the Asian countries. We thaw it in warm water or trickling tap water. I use cold water or I leave it on the counter to defrost if I remember early enough. Apparently, you aren’t alone, Laura! I use the cold water method. I remember my mom thawing meat in the microwave and how it would cook on the edges and stay frozen in the middle. hated that! I will actually resort to a meatless meal if I’ve happened to forget the meat in the freezer! I agree, the partially cooked on the edges is unappealing. I use warm water if I have not pre-thawed in the refrigerator. I’ve done this or left mine on the countertop. Shh! I work in a school kitchen and have taken the food safety classes. I promise I don’t use this practice at work! I put my meat in hot water in a hurry and in the sink if I plan ahead of time. We have never gotten sick from it either. I use the cold water method also. It really does defrost super quick and is ready for dinner right away. We use the stove top or toaster oven for reheating leftovers. It’s quicker because everyone’s meal is ready and at the same time and seems to keep warm longer. Leftovers make a great dinner for a family game night! Nice and easy with lots of variety! Cold water method for me, too. I too thaw it in water….. when I’m not lying out out on the counter all morning so I can cook it for dinner that evening. Or in the case of ground beef, I cook it from frozen. I also put frozen roasts in the crockpot overnight. The trick to not getting sick by this method is using the meat within 4 hours. This method is very effective for smaller packages of meat (I do it all of the time), but not a great choice for large roasts, turkeys, whole chickens, etc. They would take too long to defrost in this method and would stay in the danger zone long enough for harmful bacteria to take over. Agreed about the larger meats and especially poultry! Funny thing. Our microwave went out a few weeks back. The only thing I used it for was warming up my forgotten coffee and warming the baby’s milk. We used the stove to warm her milk, which was quicker and more efficient. The coffee we did the same way. I’m detoxing now , and I don’t drink coffee near as much. But rather than buy a new microwave, I picked up a freebee from someone at church. That way, the kids can warm something if they need to. I don’t particularly care for microwaves, but they are a bit safer for the younger kids or if you don’t want them cooking on the stove. Wow! Look a this! You’re not alone! I wouldn’t have to say this since so many others have, but I will anyway…I use cold water and sometimes hot. I’ll have to experiment and see which is faster; hot or cold. Wow! Thanks so much for posting this! I work full time and am often guilty of forgetting to take out of the freezer whatever I plan on cooking that night, or it’s the old favorite of nobody knows what they’re hungry for and I don’t come up with an idea fast enough. I did have a “duh” moment because it seems so easy but I never thought of it. Thanks again! I do this, I thaw food on the counter, AND we have even re-frozen meat that was somewhat thawed…been doing it for years…no sickness! I’m so glad I’m not the only one who has done this. Thanks for always being so real with us and making the real food journey much more doable. I didn’t like to defrost meat in the microwave, even when I used one years ago. I did not like the little sections of cooked meat that invariably happened. I always threw that part away, wasting food. I have never done it this. I usually brown ground beef so if it is frozen I just put it in the pan and fry it slowly. I’ve done this for years – ever since I evicted the microwave. All 10 of us are still living to tell about it. It sounds strange, but I’ve noticed that organic g. beef seems to thaw a lot faster than conventional. At least that’s my experience with thawing meat using water. Totally do this too….usually cold water but I will try the warm water and see if it’s faster. Ha! I regularly never do this as well. :) We ditched our microwave about 10 years ago. Our microwave has been used for years as an extra storage cabinet! 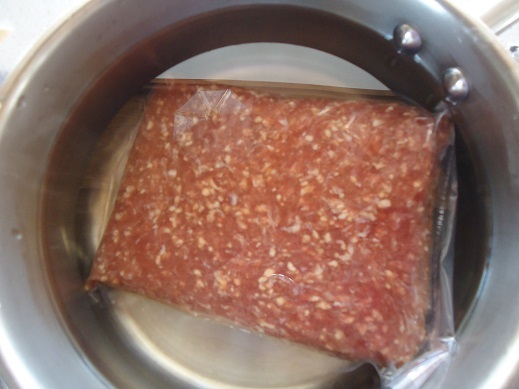 I use the cold water method and make sure the meat is fully immersed if I won’t be cooking it for several hours. Use the warm water method if I’m going to cook it immediately. If you want to thaw in the microwave and avoid the burned edges, put the package in a large bowl of cold water and put it in the microwave for 3 min. then wait around 10 minutes and flip the package over in the water and do it for around another 3 min and then check after another 10 min. This works for smaller packages of meat that are around 1 to 2 lbs. If it has thawed to desired level dump the water out of the bowl. I have a large pyrex bowl that I use. Keeping the package of meat in the bowl of water keeps the edges from getting overdone and burned. My husband figured this out and we have done this for years when we have forgotten to take it out and it has worked great. We normally use this for hamburger, ground sausage or chicken breasts and then cook it immediately. What I have heard is that you don’t want meat sitting out at room temperature for very long, so the industry covers their liability by telling us to never use such methods for defrosting. However, since we’re doing this method when we’re in a hurry so the meat is only at room temp for minutes before being thoroughly cooked, there’s really no danger.